In recognition of the implementation of the core programme of Right to Read literacy support services as coordinated by the library service, Sligo Library are delighted to have received the Right to Read Award 2017. Right To Read is a collaborative cross-government initiative that provides a nationally coordinated framework for literacy support and reading development in all local authorities. Right To Read supports literacy development for individuals, families and children and provides core services, resources and initiatives for a range of user groups. Services to schools are also an important element in Right To Read with libraries offering class visits and class readers. Sligo Library Service has also attended a number of open nights at some of the second level schools in the county and has promoted the ‘Reading Passport’ concept to incoming first year students. The award was presented to Pauline Brennan, Executive Librarian, Sligo Library by Sean Canney TD, Minister of State for Natural Resources, Community Affairs and Digital Development. 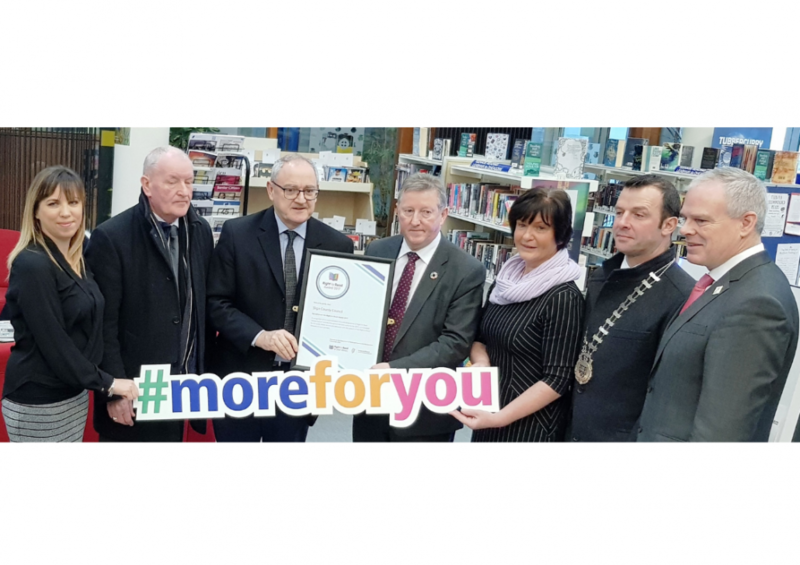 Also in the photo, from left to right: Michelle Brennan, Librarian (Acting), Tony McLoughlin TD, Donal Tinney, County Librarian, Lease-Cathaoirleach, Paul Taylor and Ciaran Hayes, CEO, Sligo County Council.